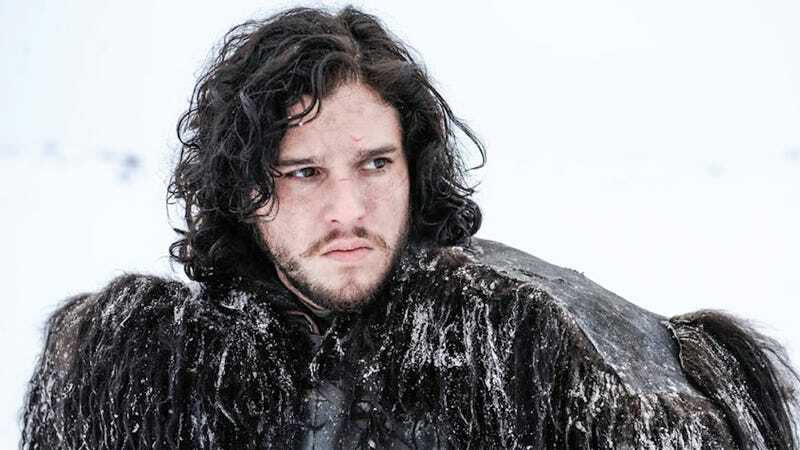 Last January, Rob Bricken at our sister site io9 wrote about Game of Thrones’ Jon Snow and what it means when Kit Harington, the actor who portrays Jon, appears on the red carpet without his trademark silky locks. What it means, of course, is that Jon Snow is going to DIE. As Harington has pointed out in several interviews, he is not allowed to cut his hair until his Game of Thrones commitment is over. So naturally, Jon Snow fans panicked when, back in January, he showed up to the U.K. premiere of his upcoming WW1 movie Testament of Youth with a short(er) haircut. Now, don’t go throwing yourself off the Wall in a dramatic show of wildling grief quite yet because, based on new evidence,the end for Jon Snow might not be quite as nigh as previously suspected. Here’s Harington looked at the New York Testament of Youth premiere on June 2. See? Jon Snow, alive and thriving. Everyone on the internet? Literally everyone? Yes. Literally everyone on the internet freaked out and was like, “Kit Harington is unrecognizable! Look at him!” Do you ever just want to shave your head? That was a wig! I couldn’t cut my hair. Part of being an actor is going into a role and looking a certain way. I’m doing this ongoing role and I have to go about looking that way and that’s what I just look like right now. Whenever Thrones finishes and the next role comes up, I’ll change. You know nothing, conspiracy theorists.